Book Week will end on a high note with a disco on August 26th from 5.30-7.00pm. Dress up in Kiwiana theme, as your favourite book character – or as anything you want! Free tickets must be collected from the school office (available from Wednesday 3rd August until the 24th). Entry is strictly by ticket only. Please join and share our Facebook event. Some food will be available to purchase – sausage sizzle, pop corn and baking. There will be some fun games and a free photo booth – and lots and lots of dancing! Please note: children must be accompanied by and adult and we ask you please respect our request that all children stay in Nga Maara hall once it’s dark outside. This year’s book fair will be held from 22nd-26th August and has a Kiwiana theme! Scholastic books will be available to view and purchase everyday that week from 3.00-4.30pm in Room 3. This is a great opportunity to buy books to put aside for birthdays and Christmas and a percentage of the total sales goes to the school. Our Book Fair is open to the public, so please do invite friends and family to attend. Please join and share our Facebook event listing. Note we don’t have EFTPOS so please bring cash or pay by cheque. We’re fortunate to have a number of special visitors over the week to run some exciting activities with the children.Here’s the plan for the week, and remember, books will be on sale everyday after school from 3.00-4.30pm. A reminder about the Parents and Friends (PFA) AGM and family night this Thursday. BYO dinner after which there will be the AGM and a speaker. Children are welcome to wear their PJs and watch a DVD. We will be looking for new members to join the PFA to help organise family evenings and events as some of the current committee need to step back. Please consider joining as we’ll be calling for interest during the AGM. Here’s a bit more about what the PFA do – it makes an important difference in our school community to have an active PFA to support our families. 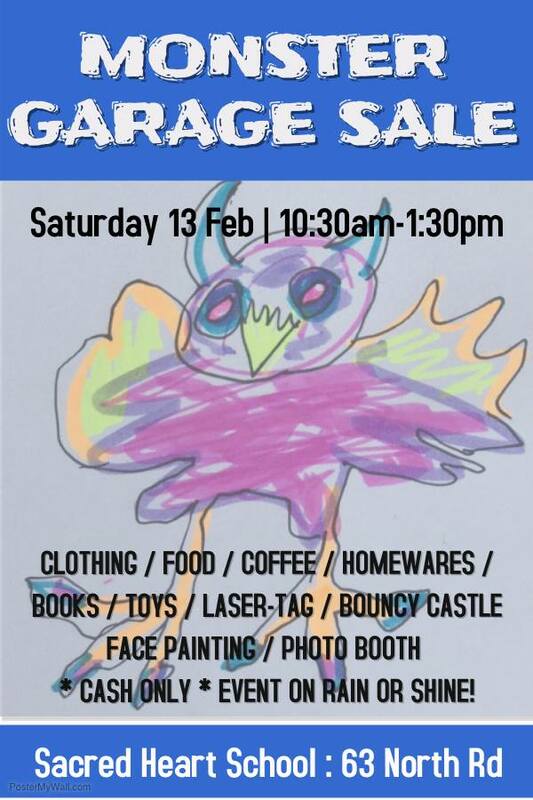 The popular Monster Garage Sale is returning to Sacred Heart School on Saturday 13th Feb from 10.30am-1.30pm. This fun community event is a perfect day out for family and friends with a variety of stalls: baking, boutique second hand clothing, ‘white elephant’ homewares stall, sausage sizzle, and coffee by Grid – there will be plenty of bargains for outfitting student flats. A range of fun activities for kids will be available including: bouncy castle, face painting, nail bar, photo booth and Megazone’s pop-up laser tag! Place a bet or two on the Dove Derby – pick a dove and guess how long it takes to get back home to Green Island! Top pick takes home a cash prize of $100. Thanks to White Doves Dunedin! Do join us on Saturday 13 February from 1030-130 and meet our wonderful community at Sacred Heart School, 63 North Rd. Ukuleles and cheese rolls – what’s the connection? It’s delicious cheese roll time! 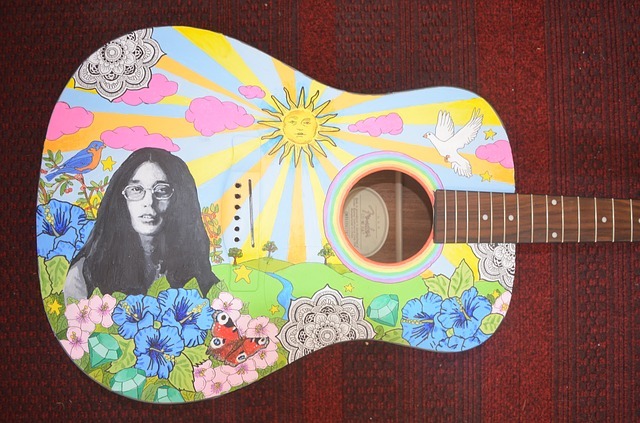 Sacred Heart is fundraising for a set of their own ukuleles so our children can take part in the Ukulele Jam this year. You can support us by purchasing delicious home made cheese rolls – 1 dozen for $6 or 3 dozen for $15! You can order and pay at school or online here. Your cheese rolls will be available to collect from Sacred Heart School office on Friday May 29th. Orders and payments need to be made by the Wednesday 20th May.